Updated with technology exclusive to Primrose, our fox deterrents are the most advanced on the market. With a built in motion sensor, the device will only emit ultrasound in the presence of a fox, ensuring the animal does not become accustomed to the repeller. With HyperResonance Frequency™ and BehaviourSpecific Timing™, the ultrasound is emitted at irregular time intervals at varying frequencies, ensuring maximum distress. 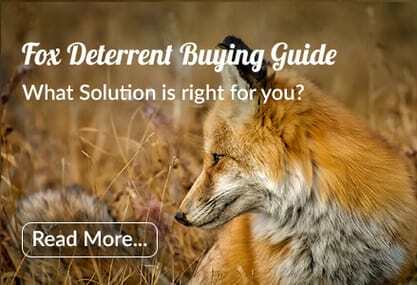 Fox deterrents are designed to make an area uninhabitable to foxes without harming them. Solutions include ultrasonic repellers, which emit high frequency sounds that are inaudible to humans, but annoying to foxes, and fox repellent sprays, which produce scents horrible to foxes, but undetectable by humans. What's the best fox deterrent solution? Ultrasonic repellers are the perfect deterrent for getting rid of foxes and making sure they stay away. You might be familiar with the common problems foxes can cause. If you have pets such as rabbits or gunea pigs in the garden they are often at risk from hungry foxes. Likewise if you keep livestock such as chickens you will be all too aware of the risk of fox attacks. Alternatively you might be sick of having to clean up the mess left behind by foxes from the night before when you wake up in the morning. Foxes are notorious for digging up flower patches, going through rubbish, leaving litter strewn around your garden and fouling on your lawn. These are just some of the problems that can be avoided with an ultrasonic fox repeller. 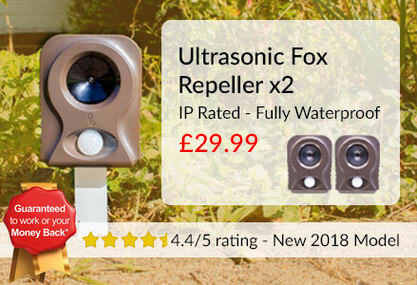 Our range of ultrasonic fox repellers emit a high-pitched signal which drives away foxes but cannot be heard by humans. The ultrasonic repellers are motion sensor activated which serves two purposes: you will only be using electricity when a fox is actually in the area and the fox will come to associate the high-pitched signal with its own movement. This association will further enforce the deterrent effect upon the fox and ensures your garden will be free from pesky foxes for years to come. Quick, effective and humane relief from common fox problems.